A Chronological Survey of Work for the Blind (with an appendix on the up to the Year 1930. WAGG, Henry J., assisted by Mary G. Thomas. A very nice bright copy in original dust-wrapper. Clean and tight. 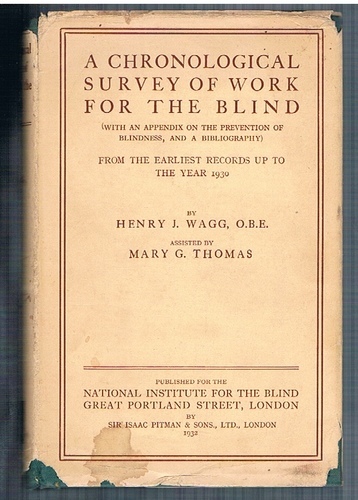 With very many b/w illustrations, appendices, bibliography, index, lists of vocational opportunities and societies for the blind. Small mark to upper board, dust-wrapper torn at spine ends. Internally excellent, bright and crisp.